Rotary compressor is the type of positive displacement compressor. As the name suggests, rotary compressor produces compressed fluid/ refrigerant by the rotary movements of blades or the movement of eccentric roller connected to the motor shaft. Since the clearance volume for a rotary compressor is negligible, its volumetric efficiency is high compared to the reciprocating compressor. Normally the prime mover (motor) and the compressor is pressed into a single cylinder with no vapor space between compressor and shell. So they are also small and light. One of the most important features of the rotary compressor is that it lacks the suction and discharge valves as used on the reciprocating compressor. 👉The dynamic action compressor like a centrifugal compressor and axial compressor are also categorized as a rotary compressor in some instance. The general construction of the rotary compressor has a cylinder with an intake and discharge port, and it has a roller inside the cylinder. The roller rub against the inside wall of the cylinder while it rotates. The fluid (refrigerant) is get trapped between the space between rotor and cylinder. The trapped fluid is then progressively get compressed by decreasing the annular space between the rotor and cylinder. The process can be described in four intermediate steps. 1. 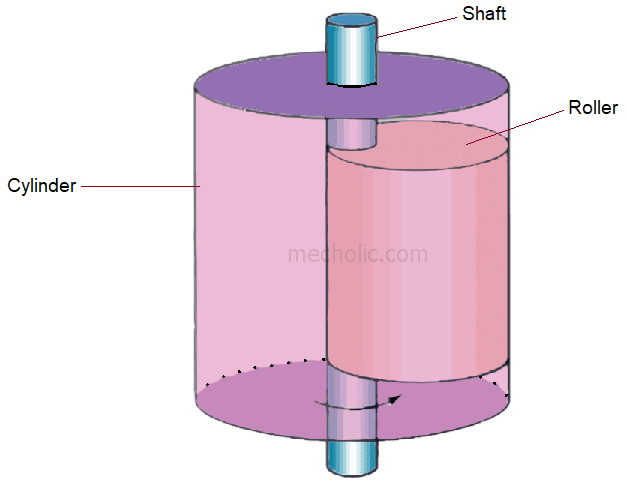 Introduction of fluid into the compartment between roller and cylinder. 2. Sealing the suction port and trapping the fluid inside the chamber. 3. Compression of fluid by decreasing the volume of the chamber. 4. Discharging of high-pressure fluid through the discharge port. The rotary compressor is usually arranged as a single unit, sometimes it arranged as series of the compressor with or without an intercooler. The rotary compressor is generally used where a large volume of high-pressure fluid is required. For large industrial applications, high power air tools like jackhammers and impact wrenches, pneumatic pumps, sandblasting operations. It is used where continuous fluid flow is required, such as automated manufacturing, food packaging plants. Rotary compressor is compact and light. It does not exhibit vibration and shaking forces as that of the reciprocating compressor. So it does not require a rigorous foundation. High volumetric efficiency since the clearance volume for a rotary compressor is negligible. It operates at high speed, so it can handle a large quantity of fluid. Machine parts are well balanced. Less noisy. Lubrication is simple, and the output fluid is free from dirt/ oil. Discharge pressure per stage is low compared to the reciprocating compressor. No flexibility in capacity and compression ratio.